"Versatile simple and quick utility to split PDF files"
PDF stands for Portable Document Format and has become one of the de facto formats for information distribution for a variety of reasons that don't matter for the product presented here. What does matter is the fact you probably regularly receive PDF files that might be rather large, or contain parts you would rather see eliminated from the document. As such, this might be one of the reasons you reached this page and are reading this article, as here we present the product called A-PDF Split. 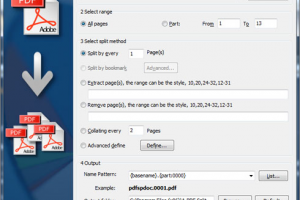 It is a simple and fast utility to split any PDF file into smaller ones, offering complete flexibility and control over how files are split, including by pages, bookmarks or odd and even pages, for instance. With A-PDF Split you'll also be able to extract or remove parts from the source PDF file as well. So, if interested in finding out how it works for you, proceed to the download.